Texting My Pancreas: #GiveAllTheThings: Alecia Wesner Jewelry. UPDATE: Congrats to the winner, Jennifer! I would wear this necklace to work! At home my baby would rip it off, but at work it would remind me that even on the craziest classroom days, everything will work out! 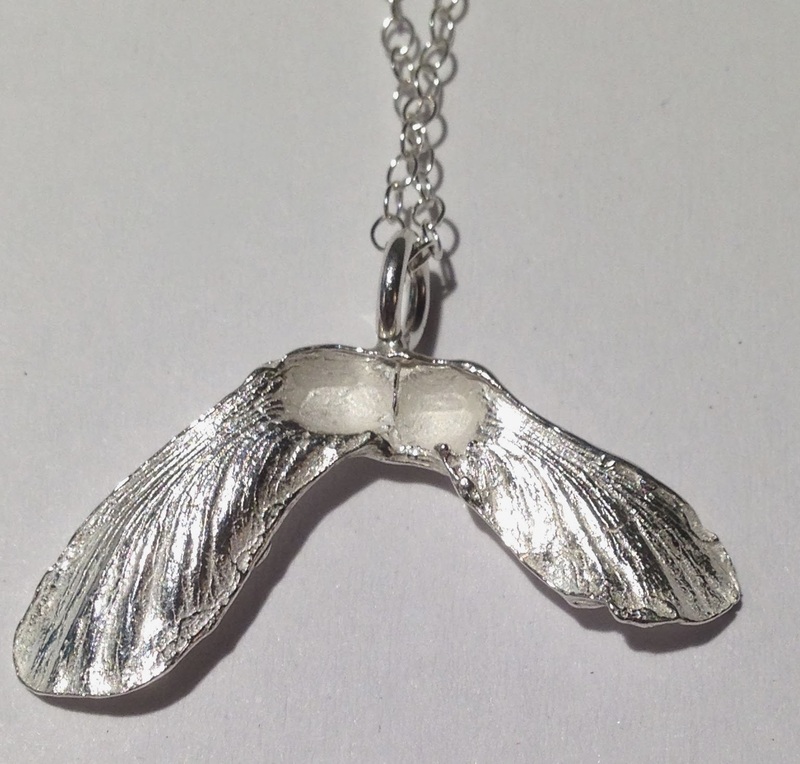 What you can win: The Double Maple Seed necklace, handcrafted with sterling silver on an 18" chain by a fellow PWD! "If things seem like they are spinning out of control, just remember, that's EXACTLY how little maple seeds get where it's going. I love being hands-on with the jewelry I create. What makes my Maple Seed collection so unique is that these 'charms" are not a direct casting or a "duplicate", but rather, they are an imprint. After painting a dried double maple seed with layers upon layers of precious metal clay (fine silver), I bake the concoction in a kiln. While the clay and Maple seed burn away, what remains is a fine silver imprint of the seed. After some polishing, I make a mold of my fine silver maple seed and later cast the seed in sterling silver (stronger and more durable than the fine silver). Whew, so that's how it works. It takes time and dexterity and patience. Like I mentioned, sometimes things do seem to spiral out of control, but that's exactly how a little maple seed gets a shot a being a strong, beautiful tree." To enter today's contest: Use the Rafflecopter widget below to enter today's contest. You will earn two entries by leaving a comment on this blog post (this is required to enter the contest) telling me where you'd wear this gorgeous necklace, if you won. You can earn one additional entry for liking the Alecia Wesner Jewelry Facebook page. Rules: This contest ends tonight at midnight CST, and is open to U.S. residents only. #GiveAllTheThings contests are intended for people with diabetes (or their caregivers) only. Since the Rafflecopter widget requires you to share an email address, I'll be emailing the winner (as well as announcing them through an update on this post) Saturday morning - you'll need to respond to me by Tuesday evening (let's say 7:00 pm CST) with your shipping address in order to claim your prize. If I don't hear from you, I'll pick a new winner. Um, if I won this necklace, I would wear it EVERYWHERE! This necklace is gorgeous! I love the message behind it. I think it would be a good reminder that everything will work out. If I won I'd wear this necklace everyday. Everywhere. I love the message behind it. Not only would I like to keep that close as a reminder but maybe someone would ask about the beautiful piece and then I could pass that message along to them. That life gets chaotic but there is beauty there. I would wear this to work everyday, as right now my job always feels like it's spinning out of control! I love the idea behind this piece! I'd wear this everywhere, it's simple and I love the meaning! I'd wear this pretty much anywhere, but am thinking of some upcoming conferences where it would look especially nice! This is something I would wear to start off the New Year. Like this seed, I am hoping that 2014 will be a year of new growth and better times. Our family could certainly use it. I'd wear it in a house. I'd wear it with a mouse. I'd wear it in a box. I'd wear it with a fox. I'd wear it with a yam, I want to win it, Christel I am. BEAUTIFUL!!! I'd wear this necklace all the time! My alma mater has a campus full of maple trees. They're by far my favorite tree. Oh wow it is beautiful and just my style! I'd wear it to work and to any event I go to! I just checked out her facebook page and I love so much of her jewelry! I would wear this every day to work, and relate the story to my patients (I'm a physical therapist) with neurological conditions who often feel like their lives aren't in their control any longer. I love it! I would wear this every time I start to feel down about my diabetes to feel more in control. I'd wear this everyday, everywhere bc you never know when that moment of weakness will come. Love this necklace! !